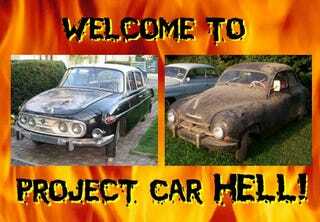 Project Car Hell, Czech Edition: Tatra or Skoda? We've received some great tips for Project Car Hell, but tipster Bobash takes it to a whole new level with these finds. After watching the excellent Czech-hoonage Tatra promotional film, Happy Journeys, he found both a Tatra 603 and a cop-style Skoda 1201. Not only that, he did the translation, provided all the historical background, and even saved our lazy asses a bunch of work by providing a bunch of writing in Jalopnik-approved PCH style. Thanks, Bobash- you're first in line for one of the groo-oovy PCH tipster prizes we keep promising to provide! So hop on the first flight to Prague, ye of eternal vehicular torment, and get ready to wake up as a giant cockroach with a wrench in each of your six hands, because we're entering Kafka territory with these cars. You just know any nation that considers Frank Zappa the greatest American who ever lived is going to produce some seriously cool cars, and the Czechs don't disappoint with the Tatra 603. Face it, no car freak worth his or her salt can resist a machine with a rear-mounted, air-cooled, hemi-head V8. And for just 60,000 CZK (about $3000), you could have this '71! Since these cars were available only to Commie officials, the bureacracy figured they'd just issue new ones every few years; hence, no rust-proofing! But you're in luck here- maybe- because this Tatra's seller claims the body is in good shape. The brakes, not so good, but don't worry- brake parts should be easy to find (well, actually, Bobash says they're made from pure Unobtanium even in the Czech Republic). But it runs! It drives! It comes with spare doors and an extra brake booster! For those who want to go Czech with their rides but feel the legacy of oppressive Iron Curtain secret-police bureaucrats is just too much taint on the Tatra, how about a nice '57 Skoda 1201? It's priced to move at a mere 35,000 CZK ($1750), leaving you enough money left over to get staggeringly drunk on quality Czech beer... which you'll probably feel like doing once you realize that even the most insignificant components are going to require fabrication from scratch back in the USA. But banish such thoughts! The seller doesn't waste our time with excessive description; all we get is "I sell a 1957 Skoda 1201, with title." There's probably rust. It probably doesn't run. But so what? With its mighty 45-horse 1221cc engine, this was not only the car of choice for Czechoslovakian traffic cops but the biggest car the common man could buy back in the day. Imagine this thing slammed down low, with big fat tires and a Tatra V8! Stastnou Cestu!